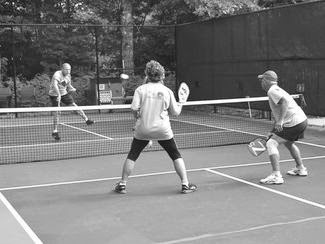 On Sept. 26 and 27, pickleball players from North Carolina, South Carolina, and Georgia participated in an Advanced and Intermediate round robin tournament at the Connestee Falls pickleball facility. This was the fourth year of the tournament and funds raised have increased every year. Pickleball, the fastest growing sport in the country, is a hybrid of tennis, racquetball, and ping pong. The court is about one third the size of a tennis court, the paddle is the size of a racquetball paddle, and the ball is similar to a Wiffle ball. The fast-paced game has become very popular with seniors because it provides lots of exercise but involves shorter running distances than tennis, and is consequently less strenuous for aging knees. The $8,000 was raised through sponsorships by local businesses, registration fees for players, donations from Connestee Falls residents, and a raffle. The tournament was part of the Connestee Falls Student Scholarship Program that raised approximately $60,000 for Transylvania County students this year.